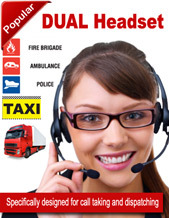 Emergency DUAL HEADSETS, Dual Boom Transmit Headsets - for Emergency Centres Dispatch Police, Fire, and Ambulance. Call Taking Taxi, Logistics, Truck Freight. This unique Emergency Dual Headset allows the operator or dispatcher to have a conversation on the radio and at the same time taking a telephone call. Dual Boom Transmit Headset - Specifically designed for Emergency industry call taking and dispatching like Taxi, Logistics, Truck Freight. Used by over 300 Emergency call takers Australia wide. Emergency centres such as Police, Fire, and Ambulance. Also this unique “Dual Boom Transmit Headset” is perfect for Transport i.e. TNT, Linfox, courier companies, Taxi and other industries where dispatching is used.